By far the most fun way to tour and explore Key West and the surrounding area is with the extremely popular island jet ski tour. Sunset Watersports offers this fun island tour adventure. The tour consists of a 25 + mile guided journey around the island of Key West and the surrounding islands. Your guide will point out the islands historic spots and history along with taking you to some of the areas most pristine and beautiful locations. Sunset offers one of the most reasonably price tour available. You can also be sure your jetski will be a newer machine since they replace them each season. Everyone should take this fun tour at least once in their lifetime. Join them for a tour through this twenty five room Victorian Mansion. Open 10A.M. through 5P.M. daily. Adults $5.00/ Children $1.00. Come and enjoy one of the largest most beautiful history filled homes while in Key West. Beautiful, modern six guest 42 foot trimaran. Features sailing, snorkeling, swimming, fishing, you choose! Add a sunset dinner cruise for a beautiful evening on the water. 1/2 day or full day - it's your vacation, your choice. Custom packages also available upon request. TRIPS TO THE DRY TORTUGAS ON WITH SUNNY DAYS - Join Them on the Dolphin Cat! They have dolphin trips for as cheap as $55 for adults and $45 for the kiddies. They will take you out to one of the many reefs in the area to see first hand a truly incredible underwater ecosystem. They offer a variety of options for charters including dolphin encounters, snorkeling and trips to the World Famous Dry Tortugas. GHOST TOURS OF KEY WEST - THEY are the ORIGINALS! This is the original Ghost Tour created in 1996 by "Ghosts Of Key West" Author, David Sloan. ACCEPT NO IMITATIONS! Their evening guided tours are a lantern-led 1 mile stroll through the dark shadowy streets and spooky lanes of Key West's Old Town. GO GPS TOURS - GUIDE YOURSELF ON YOUR KEY WEST TOUR! Explore Key West at your own leisure time. Their handheld GPS Explorer will take you on an interactive, educational, entertaining, self guided visual & audio tour. They provide you with a narration for any of the popular tourist locations in the Key West area. ISLAND PLANE TOURS FOR THE SERIOUS THRILL SEEKERS! Located just minutes from our Key West vacation rental on the beach. This is your chance to see Key West in an authentic, vintage open-cockpit biplane. Two passengers ride up front as our experienced pilots show you some amazing views including shipwrecks, sharks, dolphins, the living coral reef and much more. For all ages - prices start at just$60 per flight. 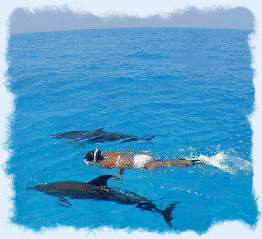 Islescapes private snorkel trips guarantees you an adventure that you won't soon forget! . They will provide all the equipment and will transport you to some great snorkeling spots. You will see an incredible amount of marine creatures and stunning underwater coral formations. Their trips can be customized per your request! FREE BEER (woo hoo!) or soft drink at the end of your exciting and educational guided trip around Key West on our 27 mile island tour on your own wave runner. Or you can just rent for one hour in our four square mile play area. They are located on US Highway 1 in the Hurricane Hole Marina. You can relax and enjoy a leisurely ride along our quaint streets and hidden lanes. Learn about exotic tropical plants and enjoy freshly cracked coconuts. Explore a miniature rain forest and enter a magical tropical garden. Come with them, away from the crowds to see the real Key West. Featuring day, sunset, and night sailing cruises. Departs daily from the historic Seaport. Relax or help our experienced staff hoist the sails against the backdrop of Mallory Square Celebrations on 2-3 hr cruises. Were also available for weddings or that special event! The Island Ting excursion includes: Catamaran Sailing, Snorkeling at the Reef, Kayak Mangrove Exploration, Fresh Fruit Platters, Homemade Sangria, Beer, Wine, and Soft Drinks and a Buffet to top it all off. and safe for the entire family. of the living coral reef.